Kiefer Sutherland who turned to a country/americana sound recently with the release of his album Down In A Hole which we loved. Sam Palladio who plays Gunnar on CMT’s TV Series Nashville and is a talented singer/songwriter in his own right, recently appearing on a duet with Una Healy for her single Stay My Love. Glen Campbell’s daughter Ashley Campbell who is no stranger to the UK and will release her debut album The Lonely One on Friday which we also love. Family trio Wildwood Kin who released their debut album Turning Tides which recently re entered the charts and charted at number 13 on the all genre Itunes chart after an exceptional performance on the One Night Only return of The Old Grey Whistle Test. New UK Folk/pop/Country group The Wandering Hearts who have burst into the scene with a bang with their exceptional vocals and sensational melodies. TWH released their debut album via Decca last month titled Wild Silence. US act Sonia Leigh who is a favourite amongst UK country fans and has been credited on songs for Zac Brown Band as well as releasing her own unique material which is fantastic. Broken Witt Rebels who toured with The Cadillac Three last year and are a UK based Country/American/Rock band. and many more, some of whom we need to check out and get to know a little bit more. of the Atlantic and delivering an authentic, Roots-style line up to the UK. Beast Epic, gaining critical acclaim from the likes of Pitchfork, Guardian and Rolling Stone, you won’t want to miss these new cossier-than-ever tracks live for the first time in the UK from our favourite indie-folk legend. is the first headliner to be announced for Black Deer. 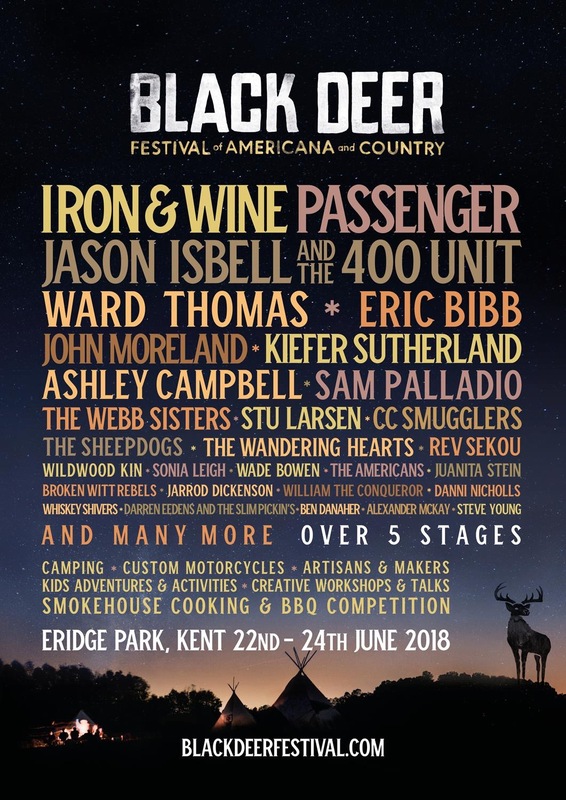 After achieving a number one in seventeen countries, selling over two million records, and reaching an astounding level of 1.7 billion views on Youtube, Michael David Rosenberg is back with full force, making his UK festival exclusive headlining the Sunday of Black Deer! has been one of the most unique voices in Americana. From his work with Drive-By Truckers through to his award winning solo work, he continues to be one of the genre’s most vital talents. He’ll be bringing his band The 400 Unit to the inaugural Black Deer in a UK Festival Exclusive. their americana-inspired rhythms to Black Deer and are sure to keep you on your feet and wanting more! last year. An evocative and beautiful album, Stein’s honeyed voice weaves stories of heartbreak and optimism in songs hailed by The Sunday Times as “A fab, dreamy journey into the dark heart of country-noir”. Expect spine-tingling treats from this indie-goddess! Praised for their grit and authenticity by the likes of The Guardian and NPE’s Ann Powers, Cornwall-based William The Conqueror are a three piece indie-rock group who perfectly chanel classic blues and roots throughout their grunge/indie filter. Their debut album ‘Proud Disturber of the Peace’ was released this summer and was shortlisted for UK Americana Awards for ‘UK Album of the Year’. Elsewhere banjo-pickers Darren Eedens & the Slim Pickin’s bring their distinctive honky tonk sounds to the festival. served up from bespoke built hostelries and headed up by the revered cookbook authors, food writers and founders of Grillstock Jon Finch and Ben Merrington. Pioneers of the American barbecue scene in the UK since 2010, Jon & Ben created the original barbecue and music festival drawing 20,000 meat fans annually to their weekend of meat, music and mayhem. from the barrel, smooth as silk aged whiskies – your senses will be transported from the very first bite and sip. Taking place as one of the centerpieces of the festival will be Bolt. Founded in 2013 by Andrew Almond, it has quickly become a key protagonist within the scene, as a brand, a lifestyle and an authentic participant of a culture rich with heritage. Bolt Motorcycles London will be curating an area of the Black Deer Festival bringing together the rich history and diverse subcultures that have surrounded the ultimate symbol of counter culture – the motorcycle. Since motorcycles were first invented they have been customised either to enhance their performance or to reflect the riders identity in regards to fashion, music or politics. boots with exhilarating outdoor adventures, cinema, Ukulele lessons and there’s even the opportunity to perform on a stage dedicated specifically for created for for budding juniors.